Coming into Monday night having lost three-straight games, the Denver Nuggets got back on track with a 103-87 victory over the Miami Heat. With the win, Denver’s record moves to 38-18, which moves them two and a half games behind Golden State for first place in the Western Conference. Monday’s victory also pushed the Nuggets record to 24-4 at home, which is the best mark in the NBA. Denver already got some good news pregame as Paul Millsap was back after a three-game absence with right ankle soreness. 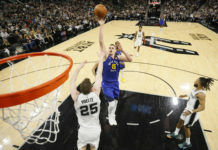 It would be Mason Plumlee that drew the start Denver though as he opened with the Nuggets first four points of the game. The Heat opened the game just as strong though as Miami held an early 9-4 lead, before Malik Beasley rattled off five-straight points to help Denver tie the game. It was a back and fourth first quarter between Denver and Miami as neither team could find a rhythm on the offensive end of the floor. That was until Monte Morris checked into the game for the Nuggets as he finished the opening quarter with 13 points on a perfect 5-of-5 shooting from the field, 2-of-2 from beyond the arc. Because of that, the Nuggets were able to take a 35-27 lead into quarter number two behind the solid play of Morris. The Nuggets defensive struggles returned to start the second quarter though as Miami opened the period on a 9-4 run to cut Denver’s lead to three-points. That was the start of a three-minute scoring drought for Denver, which lasted all the way till a Nikola Jokic jumper at the 5:59 mark gave the Nuggets a 41-40 lead. Jokic followed that shot by drilling a three-pointer on Denver’s next possession as it finally gave the Nuggets their rhythm back offensively. Miami was starting to roll offensively to though as the Heat regained a 47-46 lead with 2:57 remaining in the quarter. Denver fought back to close the half though — led by two Jokic three-pointers — as the Nuggets ultimately took a 54-49 lead into the halftime locker room. Stat leaders for Denver at the break were Jokic, who had 19 points and seven rebounds to go along with his three makes from distance. Another player who shined in the first half was Morris, who scored 15 points on 6-of-7 shooting from the field, 2-of-3 from beyond the arc. One player who struggled for Denver in half number one was Jamal Murray, who went scoreless through two quarters on 0-of-4 shooting from the field. Trey Lyles posted an identical stat line at half as Denver was not getting much offensive help outside of Jokic and Morris. 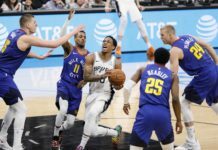 If the Nuggets wanted to snap their three-game losing streak, Murray, Lyles, or someone else was going to have to step up in half number two to help make it happen. Miami came out of the gates firing to open the third quarter, but Denver quickly got back on track after a thunderous dunk by Malik Beasley. Plumlee followed that play with his third block of the night on Miami’s next shot as the Nuggets led 63-57 with 7:41 left to play in the quarter. Denver’s lead grew to double-digits just a few possessions later as Murray and Will Barton both hit three-pointers to give the Nuggets a 69-57 lead. The same thing occurred just one minute later as Murray and Barton hit back-to-back threes to give the Nuggets an 18-point lead. This was also around the same time that Miami was struggling to score the basketball as Denver went on a 16-0 run to grab hold of all the momentum. Like they had done all night though, Miami quickly answered with a 6-0 run to cut Denver’s lead to 78-66 with 3:20 remaining in the third quarter. It was a back and fourth between Denver and Miami to close the quarter, but the Nuggets ultimately finished strong to take a 83-70 lead into the final period of play. Through three quarters, both teams were shooting under 46 percent from the field as the Nuggets were still led by Jokic and Morris, who combined to score 40 points through 36 minutes of play. 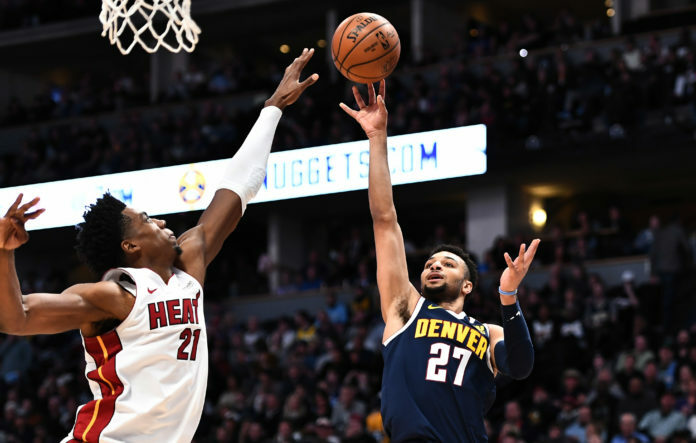 The Nuggets certainly put themselves in prime position to get a victory through three quarters as they had an opportunity to put Miami away early in the fourth. Denver did just that as they opened the period on a 5-0 run to stretch their lead back up to 18-points. Beasley hit a big three-pointer just a few possessions later to put the proverbial nail in the coffin for Miami’s comeback chances. Denver controlled the pace of play for most of the fourth quarter before Miami cut the Nuggets lead to 96-80 with 4:49 left to play. Even at that point though, the Nuggets were firmly in control of the game as they looked primed to snap their three-game losing streak. They did just that as the Nuggets finished strong to pick up a 103-87 victory over Miami. Stat leaders for the Nuggets were Jokic, who had another solid game of 23 points, 13 rebounds, and four assists to go along with his four three-pointers. Morris also had a big night finishing with 17 points and seven assists on an extremely efficient 7-of-11 shooting from the field, 2-of-4 from three-point range. Plumlee had a monster night as well finishing with 11 points, eight rebounds, three assists, and three blocks. Other Nuggets’ who finished in double figures were Barton (11), Murray (10), and Beasley, who finished with 20 points on 7-of-12 shooting from the field, 4-of-6 from distance. 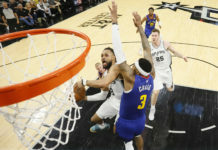 Another stat line of note came from Heat star Dwayne Wade, who scored eight points and dished out three assists in his final game at the Pepsi Center. Denver showed a tribute video for Wade during the first quarter, who got a large ovation from the Nuggets crowd upon checking in. Denver now has a day off tomorrow before they take on the Sacramento Kings at home on Wednesday night in their final game before the All-Star break.